Boise Hunter Homes will once again be hosting the event in the Saguaro Canyon Subdivision off of McMillan Rd, between Locust Grove and Meridian Rd. We have a fabulous group of local artists displaying all handmade merchandise including one-of-a-kind Spring and Easter-themed home decor, gourmet baked goods, handmade jewelry, children's apparel, hair accessories, purses and handbags, vinyl lettering, paper crafts, the hottest summer trends, child and baby gifts and much, much more! 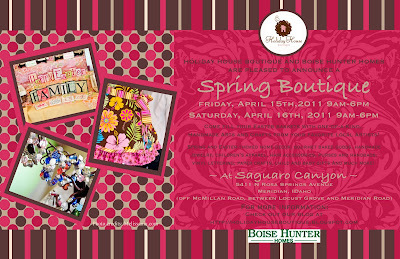 Bring your Mothers, Daughters, Sisters and Girlfriends for a fantastic day of shopping and socializing. We've got it all and you won't want to miss it!